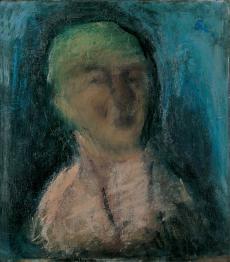 German-trained Giorgos Bouzianis is represented in the A. G. Leventis Gallery by three portraits that justify his title as the foremost Greek Expressionist painter, while Giorgos Gounaropoulos, who had studied at independent academies in Paris, conveyed a distinctive portrayal of the human soul in his dream-like images. He studied at the School of Arts in Athens (1897-1906) and then at the Academy of Fine Arts in Munich. He participated in shows at the Kunstverein and the Glaspalast, as well as at the Neue Secession in 1928, the year when he left Munich. His work was shown in exhibitions in various galleries in Germany. In 1929 he visited Vienna and he lived in Paris until 1932. 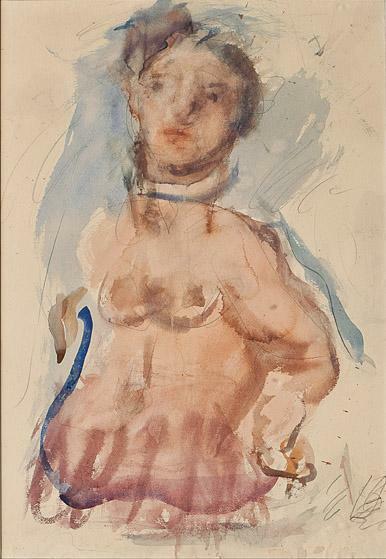 It is from this productive period that many of his watercolours, as well as his ???????? ?? ???? a????????? [Notebook of aphorisms], originate. He returned to Munich and remained there until 1934, before settling in Athens, having received the promise that he was to be appointed to the School of Fine Arts, which finally never occurred. In 1949 he held his only solo exhibition in Greece at the Parnassus Literary Society. He participated in the exhibitions of the ‘Techni’ (1936), ‘Stathmi’ (1951-1953) and ‘Omada ton Pente’ (1957) groups of artists; he also participated in the Venice Biennale (1950) and exhibitions in Erlangen (1952) and Rome (1953). He received the Guggenheim Award for Greece (1956). His home in Dafni, Athens, was converted into the Bouzianis Museum. The supreme Greek Expressionist, he was shaped as an artist in Germany under the influence of Die Brücke and Der Blaue Reiter; he painted portraits, landscapes and still-life paintings, with a visual language that eschews superficial description to convey inner human states.